Thea went for a riding class Thursday evening, moving up to finally riding a big horse. After NINE (!!) 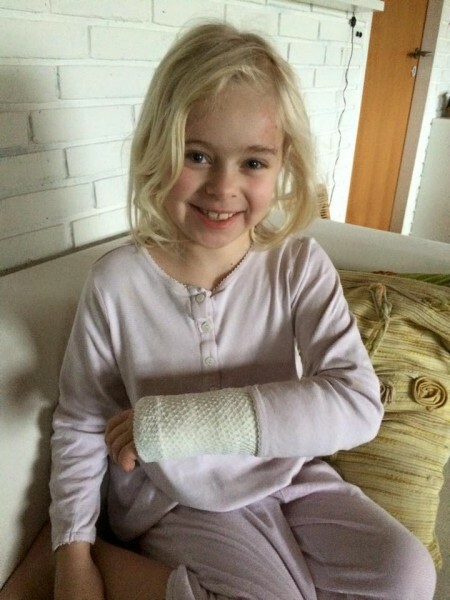 hours at the Emergency Room (from six to 3.15 at night), she went home with a broken arm and a gash on the forehead. She is such a trooper though. Yesterday she and Sarah came to spend some hours with Mum, and I went there. She is..She is such an amazing kid..
Hey thank you, she is being so cool about it all, I´m sure she will be back on that horse in no time ..
Bless her...hope she heals fast and can 'get back on that horse'! Thanks hun, she is sooo cool, and will be back on the horse as soon as she can..
Oh poor thing! But she looks like such a trooper! Det var bare alt for lenge! Thank goodness she's okay, sweetie! Thank you hun.. she is so cool about it not even scared about the horses. Oh, poor Thea! I hope everything is all healed really soon and she gets back on the horse without any issues.